Jason Baney, our 1000-yard editor, has done some pioneering work on Ultrasonic Case Cleaning. In general, ultrasonic cleaning is a “good thing” for accuracy, as it thoroughly cleans the inside of the case, preventing the stubborn build-up of soot and carbon that will eventually affect your internal case volume. However, there is one small “down-side” to ultrasonic cleaning, according to Jason. Jason found that Ultrasonic cleaning leaves the inside of the case-necks so “squeaky clean” that there is excess friction when seating bullets. On a fired case that has been cleaned conventionally (no ultra-sound), a thin layer of carbon remains to lubricate the bullet entry and exit. To restore that lubricity in cases cleaned with ultrasound, Jason applies a dry lube to the inside of his case necks. 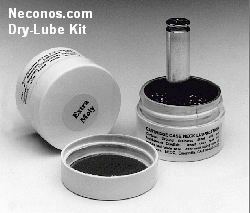 Jason prefers the $10.95 moly dry lube kit from Neconos.com. With this kit, small carbon steel balls transfer moly to the neck when you place your brass nose-down in the container. Share the post "TECH TIP: Dry-Lube for Ultrasonically-Cleaned Case Necks"